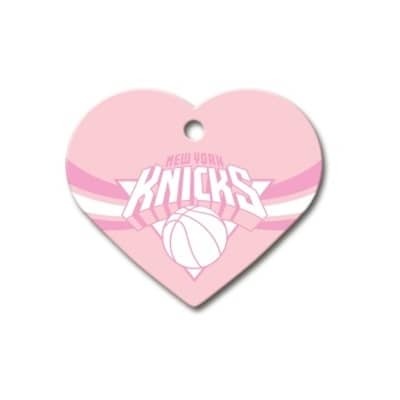 Your pet will look cute and stylish while supporting your favorite team with this officially licensed NBA heart-shaped pet ID tag with FREE ENGRAVING! 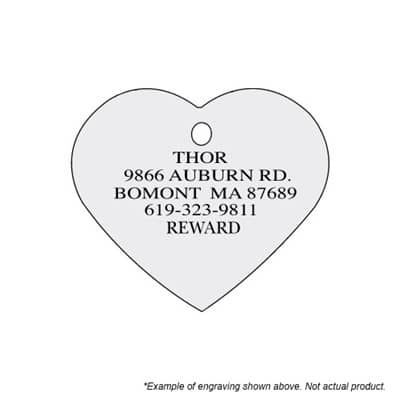 Your pet will look cute and stylish while supporting your favorite team with this officially licensed NBA heart-shaped pet ID tag with FREE ENGRAVING. Each tag is made of brass, measuring 1-1/2" x 1-1/4", and painted with the New York Knicks team logo. A split ring connector is included with each purchase. If frequent, easy collar changes are desired, consider the lobster claw styled connectors (sold separately), and to reduce noise from the tag, silencers are also offered (sold separately). Silencers also help prevent wear from other tags and charms worn at the same time. These products are also available in the accessories section below.